Alpacas produce fabulous fiber which is warmer, softer, and stronger than wool, you can call it “best-for-you” as it is organically grown in the USA. Alpaca fiber comes in many natural colors and is hypoallergenic. Additionally the fiber is fire resistant! Magical creatures with distinct personalities, alpacas are full of curiosity and endearing traits, therefore they are livestock with pet qualities. Is an alpaca farm in your future? Does the country lifestyle interest you? You will find alpacas offer tremendous financial potential. You can admire your alpaca investment while you watch it grow….naturally. 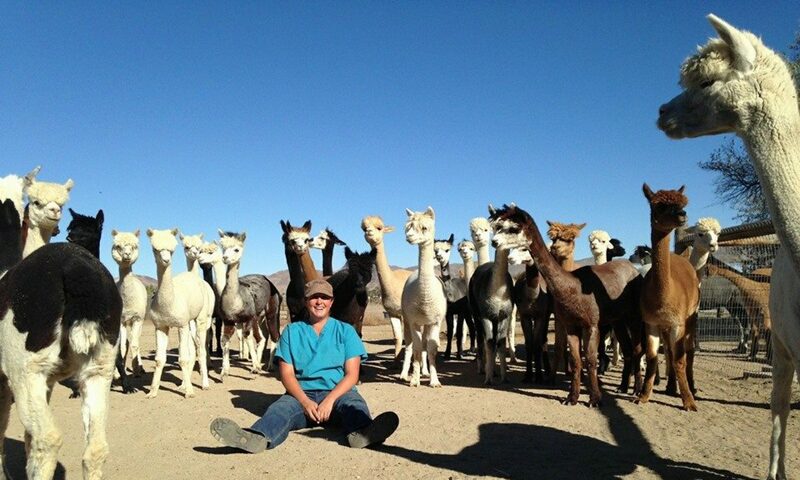 Established in 1998 in California, the Alpaca Mining Company is now an alpaca farm in Nevada. This is a full time business. We specialize as alpaca brokers and in alpaca boarding. We have acquired an extensive amount of knowledge and experience with most aspects of the alpaca industry over the years. Alpacas still like to surprise us from time to time! We are learning from each other. Sands, by using her high end sales and marketing experience, rapidly became one of the top names in the alpaca brokering business. We have sold and facilitated sales of alpacas into almost every state in the country. We have been hired as alpaca brokers by some of the most well known names in the industry. Alpaca boarding is a corner stone of the Alpaca Mining Company business. Boarding is often called agisting or alpaca agistment. Many people boarding with us are passive owners taking advantage of our brokering service, and of course, our 24/7 presence. Also, ask your accountant about livestock tax advantages . We are lucky to live in one of the most productive agricultural valleys in Nevada. As a result, access to feed and top notch veterinary care is always available. We help our clients sell many hundreds of alpacas. We are very experienced, as a result, with the process of certificate transfers, state requirements for vet health checks, and transportation issues. Ask us if you are looking for an alpaca with particular characteristics. We might be able to help. If you are looking for alpacas for sale in Nevada, give us a call. We have some here, and we know almost every other alpaca farm around. If you are looking for some pet alpacas or some fiber alpacas, (not for breeding), let us know. Every June we shear alpacas and have alpaca fleece for sale. Black and grey fleece goes the fastest, so if you want some, ask us early. Have you ever wanted an alpaca sweater? How about some alpaca socks and gloves? Knitted alpaca scarves are always very popular. Spin some alpaca fiber into yarn and make it happen. Or, with felting you can make an alpaca blanket or an alpaca poncho. Maybe make a business out of it! We get asked all kinds of questions, so we have started an alpaca FAQ page and a section on the alpaca farm equipment we found most suitable. If you want to know how to start an alpaca business or how to raise alpacas, we can help. Take a look at Sands’ blog from time to time, there you will find some entertaining stories of the alpaca lifestyle. Just wait, this blog will turn into a novel! Buy Alpacas for Fun and profit! Hyppolyta Open ARI#31358484 Black “Lyta,” the dam, was named after an Amazon queen when she was born 4/08 and is a black beauty, bold, straight with perfect carriage and is the result of a breeding of Kara of Redwood Ridge to Prince Charming ARI #842410. He is beige with very dense fleece. DOB 9/17/10 Dam: 6P Jasmine Sire: A&A;s Bermuda Blue If you are looking for black, then Sheba and her male might be just the ticket. Sherpa $1500 (out of Shaq Attack, a true black) on 10/2/14, making him the youngest on the ranch. Sheba was absolutely a wonderful first time Mom and we think she has very good future potential. Sherpa is a scamp, as “the baby” in any group tends to be! He is often the firs alpaca I see in the morning and he is one to bring a smile to your face. NWA Candar’s Quil Unproven Male Not Registered but Registerable White DOB 8/07/09 Sire: Peruvian Canadar ARI#182577 Dam: HCA Vanessa ARI#842285 (PPeruvian Vengador bloodlines) Quil is a robust male whose grandsire is the famous Peruvian Hemingway. He is intact and as such has a dominant personality with the other males. He touts wonderfully dense fleece. “A Guide to Alpaca Ownership�” as ruminated by Sands Bellizzi, is available to you free of charge. This is not a scientific manual, only practical, generalized information, including “short answers to big questions about alpacas, their history, husbandry and other frequently asked questions.” Email us by clicking here: alpaca@alpacamine.com and we will send you your copy as an email attachment. New: If you are interesting in passive ownership and herd management, please request our new Herd Management Program which we can also email to you. NOTE: We strive to provide a wide variety of alpacas from which to choose…all at good value for the quality provided and can almost always arrange financing and discounts on multiple purchases. If there is a special alpaca you are looking for, let us help you find it. We feel it is our obligation to present any reasonable offer on the alpacas we represent to the sellers. Please feel free to contact us with your specific needs or questions. We are always here to assist you, pre and post purchase. Ranch visits encouraged and questions and offers welcomed! STAKE YOUR ALPACA CLAIMS HERE! Git yerself a grubstake and fill your pan with Alpaca Gold….. Click on the thumbnail next to the alpaca’s name to see their photo (coming soon) on the larger “Wanted” poster. Both Suri and Huacaya alpacas for sale are available. Check back often as we are a bonanza ranch and find new and beautiful “nuggets” frequently…. Please notice the various locations of these alpacas… maybe some are even closer than AMC, Nevada! There are specialized transporters who cater to delivering alpacas around the states. Prices listed are open to offers, so please don’t hesitate to inquire about any alpacas you find which catch your eye! In the mid-80s, Sands saw television coverage of the first alpacas imported to the U.S. and was so intrigued with the wonderful nature of these “cuddly” creatures and the financial rewards of breeding them, she walked into the office of her then boss and said “let’s quit our jobs and raise alpacas.” The reply was “so what’s an alpaca?” Over ten years later, her dream reached fruition. Our alpaca ranch is getting real! We decided on Grass Valley due to its proximity to major population areas, seasonal tourist population, and its green rolling hills with oaks and pine along the ridgelines. We also began visiting as many alpaca ranch properties as possible. As most “wanabe alpaca owners” relate, we were very impressed with the professionalism, friendliness and underlying sense of financial adventure of the alpaca owners we contacted. We moved into our modest 2-bedroom, 2 bath home on a 5-acre parcel in late July, 1998 and ideas and methods for growth came fast and furious in this new fuzzy world. We quickly expanded our operation to include agisting (boarding), brokering, and breeding alpacas. It was our hope to be able to live off the income from the alpacas in about 4 or 5 years. That goal was achieved much more rapidly than we had dared hope. We have never regretted our decision to change our lifestyle and work focus. Why did we choose ” Alpaca Mining Company” as our alpaca ranch name? Others looked for gold in the ground in the West and have for many, many years. We hoped to start a new trend by “mining” for alpacas…hence, the “discovery” of our first “Nugget!” (The name for the first cria born at the ranch). Eureka! The Gold Rush Begins! And so it began….the story continues…in Yerington! Meet Eve Bjarnson, From Sheep to Shawl, a wonderful fiber artist who has over time purchased many bags of alpaca fiber from Us. Eve lives in Tonopah, NV and you can contact her on facebook at From Sheep to Shawl. Beyond being very talented with fleece, she is simply a wonderful person with high levels of enthusiasm and energy. We have chosen Eve as our “Featured Fiber Artist” as she is so devoted to Alpaca fiber and creating unique items. Please know all questions and purchases should be made directly through Eve on facebook. She spreads good cheer and fun wherever she goes! Special orders? Sure ask Eve!! Including in Eve’s repertoire of creativity are these Parisienne Mitts. For the work involved…Eve does all the processing, spinning, knitting, everything is hand ceated…she will make memories for you to enjoy and cherish for years to come. Yerington can be very cold, no doubt, but the winters have been bearable and our neighbors and the community are warm and receptive. We are blessed with exceptionally beautiful sunrises and sunsets and if you’re on facebook you can view some photos on the Sands Bellizzi page. While our focus has changed over the passing years, boarding and supplying livestock information regarding alpaca husbandry and care remain a mainstay and a pleasure. Keep an eye on our alpacas for sale page, you may find just what you were looking for! Would you like us to keep you updated? We will add you to our email list. Just drop us a note on the Contact Us page. We are convinced alpacas remain a solid tangible and healthy asset for your portfolio. Please come by and enjoy the alpacas with us… just give us a call. We will put the coffeepot on. We’ve Been Featured In: CNN USA and CNN Headline News Aug. 3-5. Countryside Magazine, American Small Farms Magazine, Hobby Farms Magazine, Fortune Small Business online Magazine (FSB.com), Alpacas Magazine, American Livestock Magazine, House of Business Magazine, The New York Times. www.2young2retire.com, www.planet-pets.com, www.suite101.com, www.careerjournal.com (Wall Street Journal), FineLiving Channel, Radical Sabbatical Show, carried by DirecTV on Channel 232, Times Warner Cable and various other cable channels throughout the nation – look for our Show #206….www.fineliving.com for schedule. KCRA Channel 3 Evening News, UPN, Channel 31 News, and in the Tracy Press and Lodi Chronicle. December, 2007, issue of Fortune Small Business Magazine (online, too) by writer Phaedra Hise. Did you know that alpacas are one of the earliest domesticated livestock animals in the world? Alpacas have been bred and raised for their fine fleece for over 6000 years. Ancient people created alpacas more than 1000 years before the pyramids of Egypt were built! Alpacas, llamas, vicuñas, guanacos, and camels are all related through common ancestors. The whole group are known as camelids. Thousands of years ago Indians in South America created alpacas by the careful selective breeding of the wild ancestors of alpacas; the vicuña. There is some speculation that alpacas were developed by breeding vicuñas with some unknown extinct camelid. The term ‘wool’ in the U.S. pertains to sheep only, so the alpaca industry calls the alpaca production ‘fleece’ or ‘fiber’. What makes the alpaca fleece special is that it is very fine and soft, hypoallergenic, water resistant, and flame resistant. All of this plus they come in colors of white, black, gray, brown, and every shade in between. All of these qualities have made alpacas not only very special animals, but also a vitally important part of several South American economies for over 6000 years. Alpacas are vegetarians. They are ruminants and have three stomachs, or more accurately, a three compartment stomach. Alpacas are also known as a modified ruminants due to having three compartments, not the usual four. Alpacas thrive on grasses like orchard grass, timothy, teff, bermuda grass, and many others. In the high Andes mountains, where alpacas come from, there is a native rangeland grass called ichu. Ichu is not very high in nutritional qualities. Alpacas have adapted to this grass by developing a very efficient digestive system. Alpacas are said to be 30% more efficient than sheep in digesting grass. Another question might be “what should an alpaca eat?” because they’ll eat pretty darn near anything green. That’s not always a good thing. Don’t let them loose in your garden! Most alpacas think alfalfa is the best stuff ever. However most people think that alfalfa is too high in protein and will make an alpaca fat and the fleece coarser. This is true, sort of. Sometimes an alpaca has a problem with digestion because of illness or age. Alfalfa is perfect for this. If the grass they are being fed is of poor quality, adding alfalfa is great. Another thing; lawn grass like fescue and rye should not be fed to alpacas. The reason is that fescues contain what is called ‘endophytes‘ inside the plant. Endophytes are an internal fungus that helps the grass fight off plant diseases. Great for the grass; bad for your alpacas! Rye grass can be attacked by a fungus called ‘ergot‘. This fungus contains the basic ingredient to make LSD. Nothing good is going to come from that! Strains of fescue and rye have been created to minimize the fungus problem. So if you must feed these grasses, make sure to use improved and resistant varieties. All animals need salt. Most livestock can use a salt block, but alpacas don’t do well with them. They prefer loose salt. We get ours from Stillwater Minerals. Stillwater makes a mineral/ salt mix that is supplemented with vitamins. You should keep in mind that most soils that grass hay is grown on gradually get depleted of fertility, so you must make up for what is missing. What we do is feed a variety of grass hays from different places and also supplement when and where needed. The most common answer is 15 to 20 years. A lot depends on where the alpacas live, and under what conditions. For instance, in South America the half of the alpaca babies die before their 1st year. Alpacas who’s fleece isn’t good enough tend to get eaten. Here in the U.S. the alpacas stand a good chance of living a long life. We have good food, excellent veterinary care, and (usually) fairly mild conditions. Ian Nelson imported the first alpacas into New Zealand. His alpacas were from a London zoo. Among this first group was a female that was born in the zoo and nicknamed “Vomiting Violet” for her habit of spitting. Vomiting Violet lived to the age of 28, making her the longest lived alpaca I can find with a known birth date. We have had quite a few alpacas live into their early 20’s here at AMC. Actually we have a couple of them here right now (2017).